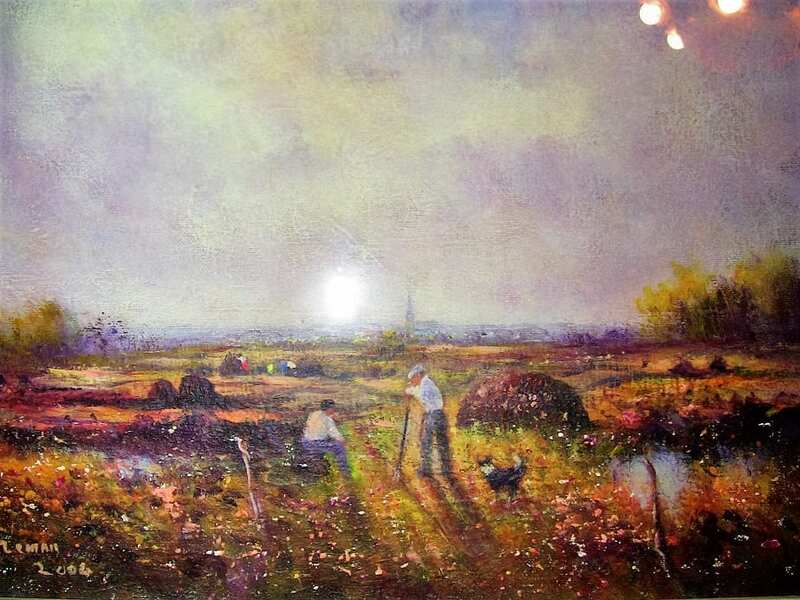 Irish Oil on Canvas of Ballaghadereen Bog by Seamus Coleman. 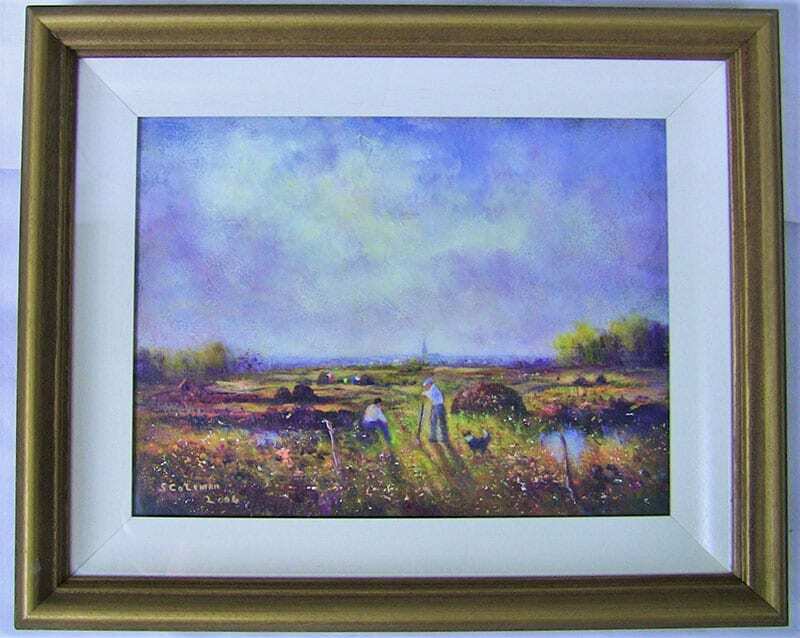 Lovely piece of original Irish Art…….by one of our FAVORITE ARTIST’S !! 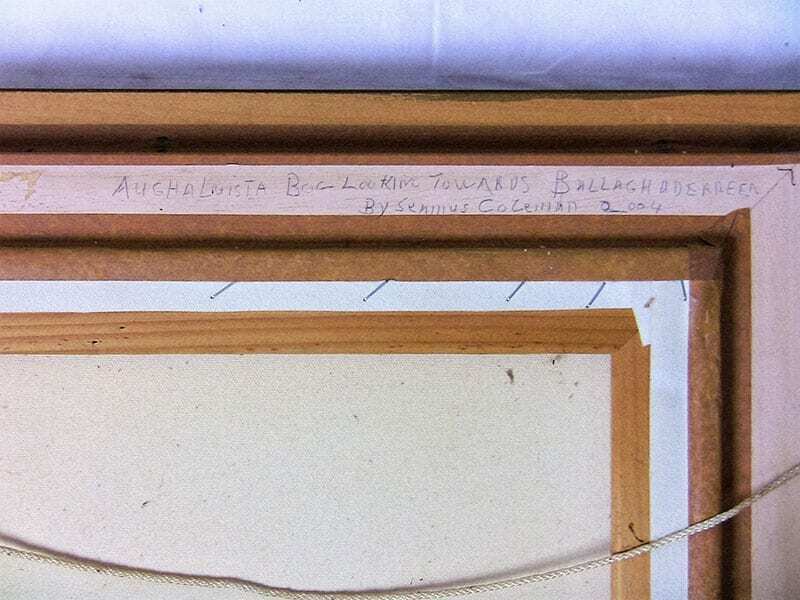 Painting by popular and rapidly rising Irish Artist – Seamus Coleman of County Roscommon. 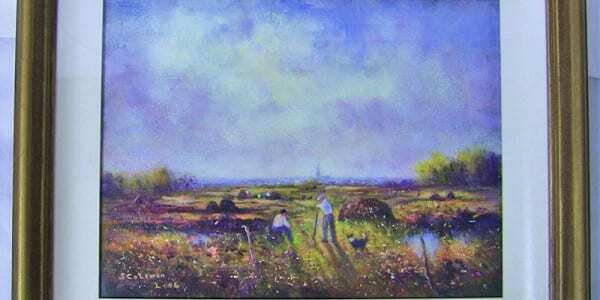 This painting is titled ” Ballaghadereen Bog”. Signed on the bottom left. GORGEOUS colors that capture the essence of an Irish Peat Bog in Summer. In Summertime......over the Centuries......Irish people have harvested peat from the peat bogs to make peat logs or "turf" as it is known....for winter fuel for the fire. Rural Irish people would own small bog plots and in the summer they would cut the peat logs and stack them in piles to dry. Once dry they were perfect fuel for the winter fire and stove. Irish Bogs have their own unique native flora and fauna and this painting beautifully reflect this ! So, this painting will only appreciate in value, as it beautifully reflects a period of Irish history and culture that may soon be forgotten. 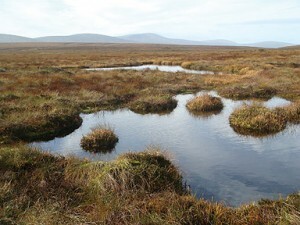 Blanket bogs are the most celebrated of Ireland’s peatlands. The habitat is very well developed in the country. We have two types of blanket bogs – Atlantic Blanket Bog and Mountain Blanket Bog. 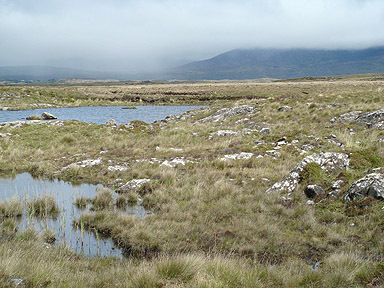 Atlantic blanket bogs cover the landscape of the west coast from sea level to an altitude of 200m. Here, rainfall is 1,200mm per year and the acid peat substrate ranges from 2 to 7m deep. Atlantic blanket bog vegetation has a characteristic grassy appearance due to the occurrence of purple moor grass (Molinia caerulea) and black bog rush (Schoenus nigricans). Patterned surfaces of pools, flat and sloped areas, flushes and swallow holes are important features of blanket bogs. Mountain blanket bogs occur on relatively flat terrain in the mountain ranges above 200m altitude. Here rainfall is high and evaporation is low. Mountain blanket bogs are rain fed and their peat is acidic. The vegetation is characterised by the presence of ericoid shrubs and in particular ling heather (Calluna vulgaris), crowberry (Empetrum nigrum) and bilberry (Vaccinium myrtillus). Natural drains, lakes and flushes are features of mountain blanket bogs. Framed behind glass.....fully signed and original. If you are Irish-American (or any other ancestry for that matter) you will love this guy's work.....it is quintessentially Irish !!! He truly CAPTURES THE SPIRIT OF IRISH COUNTRY LIVING !! HIS WORKS ARE A HISTORIC VISUAL RECORD OF CHANGING TIMES AND TIMES NEVER TO BE SEEN AGAIN ! 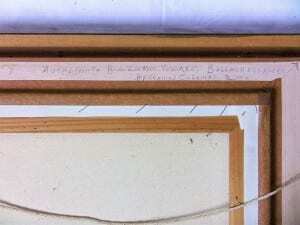 Provenance: Bought from the Artist in Ireland.